Cole had his four-month check-up today, which included three shots to the thighs. He screamed mercilessly, of course. 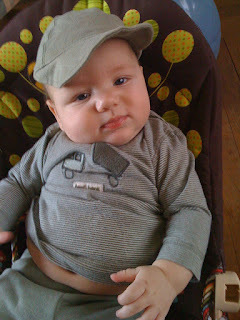 The nurse commented on his chunky thighs, “He’s only four months old?” Yes, but he is in the 90th percentile for weight. What must a baby think as he is stabbed while his own mother holds him down? Talk about buried trauma and anger toward the parent! Anyway, he seems quite content now, so hopefully he won’t get a fever or be extra fussy. I should have tried to squeeze in a nap earlier, but now Genny is home from school, making a time-out for Mom an impossibility. I believe it will be another leftover Easter dinner night, but I guess I’ll have to draw the line at three nights in a row of the same food. Although Genny probably enjoys eating the same foods repeatedly, just as she savors the same Care Bear movie over and over.